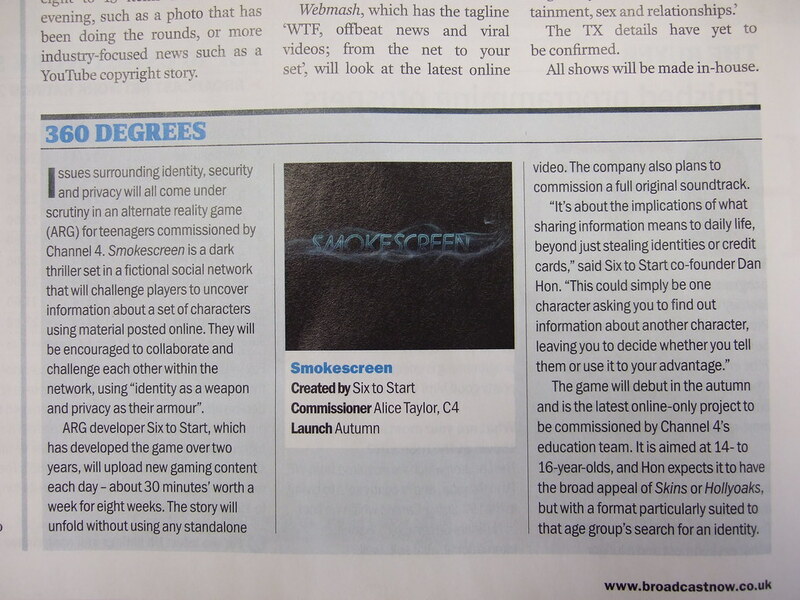 Wired UK has teamed up with alternate reality game designers Six to Start, creators of the 2010 SXSW Best Game Award winner Smokescreen, to make this month’s issue of Wired UK a platform for a transmedia game contest. Six to Start’s immersive transmedia games have been widely recognized for high-quality storytelling and entertaining game play. In Smokescreen, Six to Start and Channel 4 launched a fictional social network that brought issues of online identity and privacy to the forefront for a target audience of 14- to 19-year-olds. We Tell Stories, winner of the 2008 SXSW Experimental and Best in Show Awards, involved a collaboration with Penguin Books to encourage the reinvention and retelling of classic stories. The game has been designed to exist within and alongside this month’s Wired. The issue’s focus is on the rise of location-based and social gaming, and the idea of game-like ‘achievements’ and how they drive our curiosity and progress. Our tasks and puzzles are scattered throughout its pages, margins, graphics and text – so keep your eyes peeled! Of course, the issue is just the beginning – the game soon expands to take in online content and puzzles, alongside some cool bells and whistles that I don’t want to spoil for you! Image courtesy of the SXSW Interactive Web Awards site. It’s a big night for three campaigns tonight, as the teams behind The Dark Knight ARG, Lost Zombies and We Tell Stories have won major awards at the 12th annual SXSW Interactive Web Awards. The awards were handed out earlier tonight at the Hilton Austin Downtown, and according to The Underwire blog at Wired, the major hardware found its way into the hands of the wonderful people behind these highly successful campaigns. One of the biggest wins of the night came for We Tell Stories. This project was a collaboration between Six to Start and Penguin Books and, as reported here in March of 2008, was a way for media-savvy designers to retell classic stories through the use of technology. We Tell Stories won in the Experimental category, but as a bonus, also walked away with the Best in Show Award. This is a monumental win for the company, formed at the beginning of 2008 by former members of Mind Candy.